Monsanto executives and insiders are dumping Monsanto stock in record volumes, sending the stock price spiraling downward. CEO Hugh Grant just sold off 40,000 shares at $97.74, and both Janet Holloway and Gerald Steiner — both high-level Monsanto executives — recently ditched more than 10,000 shares each. Tom Hartley also bailed on another 6,000 shares at $100.15. The report goes on to say: At the top of the heap, Jeffrey Vinik’s Vinik Asset Management said goodbye to the largest stake of the 450+ funds we monitor, totaling close to $100.8 million in [Monsanto] stock. Sean Cullinan’s fund, Point State Capital, also dropped its [Monsanto] stock, about $54.7 million worth. These sales leave Stephen Mandel’s Lone Pine Capital with the largest holdings of Monsanto, over $613 million worth of the company’s stock. Natural News urges all investors to ditch Lone Pine Capital and take your money somewhere else that doesn’t invest in “the world’s most evil corporation.” Blue Ridge Capital also owns over $320 million in Monsanto stock and should be immediately abandoned by all investors. The Seralini study, by the way, found that: • Up to 50% of males and 70% of females suffered premature death. • Rats that drank trace amounts of Roundup (at levels legally allowed in the water supply) had a 200% to 300% increase in large tumors. 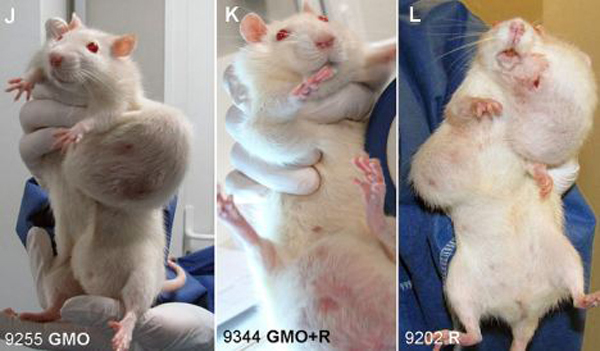 • Rats fed GM corn and traces of Roundup suffered severe organ damage including liver damage and kidney damage. • The study fed these rats NK603, the Monsanto variety of GM corn that’s grown across North America and widely fed to animals and humans. This is the same corn that’s in your corn-based breakfast cereal, corn tortillas and corn snack chips. Do the math: companies that use Monsanto’s GM corn are punished and boycotted in the marketplace. Companies that use non-GMO corn experience huge increases in sales. In food company corporate boardrooms all across America, this is a no-brainer: dump GMOs if you want to survive. The same is also true for hedge funds and mutual funds: the more they invest in Monsanto, the more they stand to lose from the global outrage against Monsanto, GMOs and GM corn in particular. Plus, I also happen to believe there will come a day when many of the top Monsanto executives will be arrested and prosecuted for their role in carrying out crimes against humanity (not just from GMOs but also from glyphosate). When that day comes, Monsanto share prices will obviously fall through the floor. The company may, in fact, implode like a dot-com bubble, leaving investors holding worthless paper instead of valuable shares… a kind of poetic justice for all those who furthered the means of such a destructive entity in the first place. If you own any of these mutual funds, sell them now and invest somewhere else. Become an “activist investor” and put your money in companies that create a better world, not companies that destroy their world for their own selfish greed. Written by: Mike Adams on September 9, 2013.